X-ray photoelectron spectroscopy (XPS or ESCA) curve fitting procedures, reference materials and useful notes are listed here to provide a starting point for the consistent interpretation of XPS spectra. These reference pages contain tips and techniques that are designed to help both the novice and advanced XPS user. Recent work by Jeremy Bourque  demonstrates the power of XPS to elucidate chemical trends within a series of compounds. 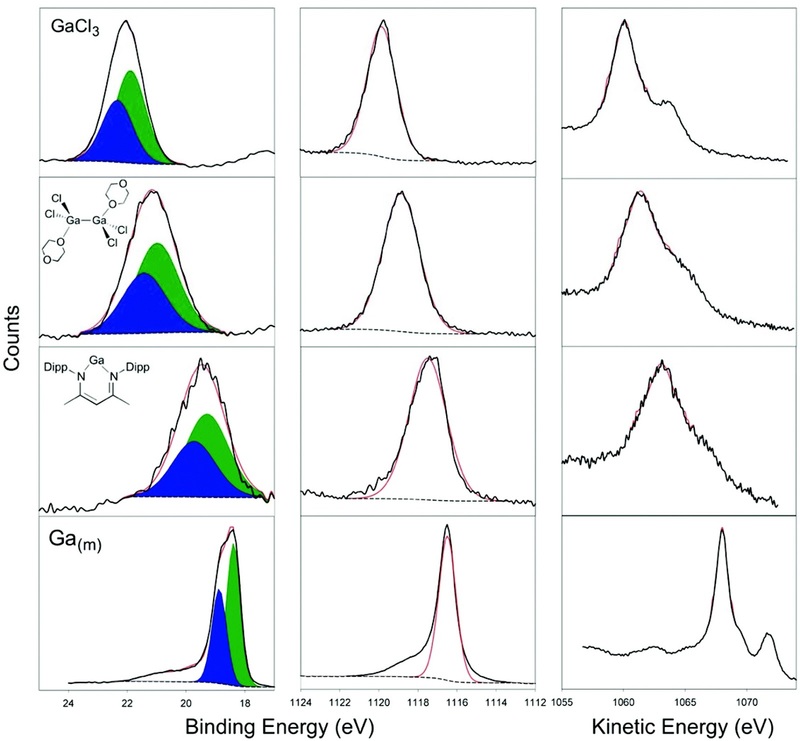 This work shows results from an extensive analysis of the Ga 3d5/2, Ga 2p3/2 and Ga L3M45M5 spectra of a broad series of Ga compounds. 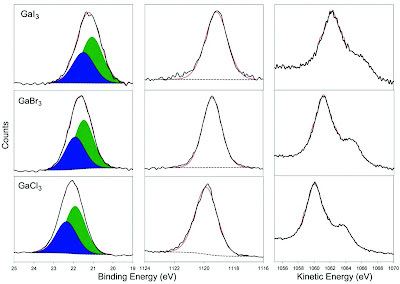 Binding energy positions, Auger parameters and chemical state (Wagner) plots are then used to understand the trends found for the various series of related compounds and to understand the chemistry of newly synthesised complexes. Examples of studied trends include the changes as the oxidation states goes from Ga(0) through to Ga(III), changes as the ligand is modified on Ga(I) or Ga(III) species, and trends in the various semiconducting Ga materials. 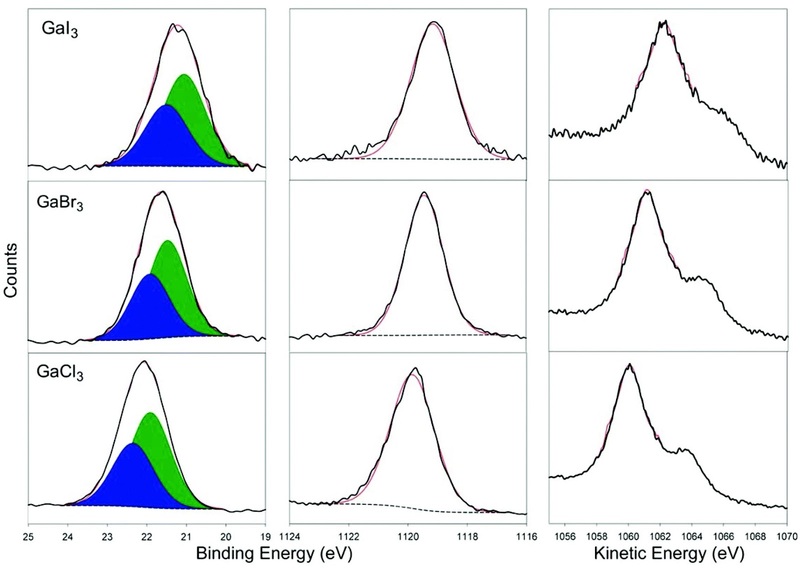 Photoelectron binding and Auger electron kinetic energies and full-width at half-maxima for high-resolution XPS spectra. Ga 3d (left), Ga 2p3/2 (center) and Ga L3M45M45 (right) XPS spectra of Ga(m) (bottom), GaNacNacDipp (lower middle), Ga2Cl4(diox)2 (upper middle) and GaCl3 (top). Ga 3d (left), Ga 2p3/2 (center) and Ga L3M45M45 (right) XPS spectra of GaCl3 (bottom), GaBr3 (middle) and GaI3 (top). Wagner plot of gallium materials using Ga 3d5/2 binding energy. Symbol legend: diamond = Group 15 elements; square = Group 16 elements. J.L. Bourque, M.C. Biesinger, K.M. Baines, Dalton Transactions, 45 (2016) 7678-7696. Click on each link below to retrieve curve-fitting details, binding energies, FWHM's, spin-orbit splitting values, references and other practical notes for that element. Other general topics are also available. Downloads can be obtained by clicking on the appropriate links. If you have any questions about XPS or if you are interested in having analyses performed please email Mark Biesinger at biesingr@uwo.ca or contact Surface Science Western.